President George W Bush has authorised cuts in US troops levels in Iraq, Secretary of Defence Donald Rumsfeld said during a visit to the country. 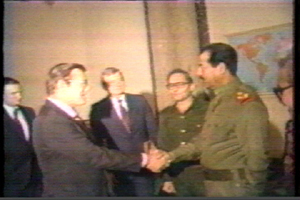 Speaking to troops in Falluja, Mr Rumsfeld did not reveal the exact size of the cut but said combat forces would be reduced by two brigades. Further reductions will be considered "at some point in 2006", he said. The move will take the number of US soldiers to below the 138,000 level, seen for most of this year. A brigade is usually made up of 4,000-5,000 troops.